This family-friendly Karon resort is within a 15-minute walk of Kata Porpeang Market and Dino Park Mini Golf. 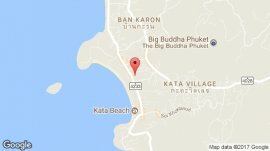 Kok Chang Safari Elephant Trekking and Karon Market are also within 3 mi (5 km). 2 restaurants, 3 outdoor pools, and a fitness center are available at this smoke-free resort. Free WiFi in public areas, free self parking, and a free beach shuttle are also provided. Additionally, a bar/lounge, a spa tub, and a complimentary children's club are onsite. All 158 rooms feature thoughtful touches like bathrobes and slippers, plus balconies and LCD TVs with satellite channels. Other amenities available to guests include sitting areas, WiFi, and minibars.